This interactive chart shows 144 ETFs (Exchange Traded Funds) which are traded (as of March 2006 [Note! dated material]) in US markets. The number of ETFs is larger but not all have yet enough history to appear here. ETFs are financial-instruments which you can buy and sell at any time during trading hours using any U.S. online broker just like common stocks. They offer better diversification than individual stocks, since you buy a whole basket in one operation. In essence they reduce the risk called "company risk" vs. individual stocks. Lower costs. Actively managed funds charge on average 1.52% in annual fees while ETFs charge 0.44% (source: IBD - April 2006). In addition, broker buy/sell commissions may be slightly lower for ETFs which trade just like stocks. In most (though not all) cases, ETFs have no "stock-picking" drag effect. Yes, stock picking is a drag. Most active managers fail to beat their benchmarks anyway. In many cases, quarter and year end distributions, are tracked as "reinvested" and not accounted for as distributions leading to even more tax efficiency. Similarly, ETFs can stay 100% invested without reserving cash to anticipate redemptions. They are essentially a basket of stocks tracked by computer. ETF "units" get created or destroyed, based on supply and demand of the underlying asset basket and the ETF itself. If you sell your ETF shares without there being a buyer on the other side, the ETF simply sells a percentage of the stock it holds. it is easier to be "fully invested" (just like in the index) in a portfolio of ETFs vs Mutual-Funds. Being fully invested should increase returns over the long term. Better transparency than mutual funds. Since active Mutual Fund managers have vested interest in concealing their actions (buys & sells) when they occur. Each ETF is a collection of financial assets (Stocks, Bonds, commodities, etc.). ETFs may be representing whole countries, regions, sectors, certain asset-classes, etc. For example, by buying an ETF called 'EWJ' one approximately buys the whole Nikkei (225 large-cap Japanese stocks) Index. There's a great choice which leads to the question: how does one chose? A good start is to stop listening to what the "experts" say, what financial magazines write, or what you may see on CNBC. Instead, tune-in to the real deal (e.g. Yahoo! Finance) and Look at the raw data. Each semi-transparent circle (bubble) represents one ETF. Each ETF is, in essence, an investment portfolio made out of multiple components (stocks, bonds, etc.) in certain proportions with very little activity/turnover. If you buy, you know what you buy. There's no money manager capriciousness effect. If you are are great believer in John Bogle's ideas (Bogle is the Vanguard Group founder, the father of indexing as a way to invest, for life, and one of the few financial luminaries I admire) -- passive & low cost ETFs might be your ticket. Have already risen a lot in the past few years and are, perhaps, due for some correction. There's a saying: "prices follow earnings", and obviously growth follows earnings too. Sayings aside, what does the data tell us? 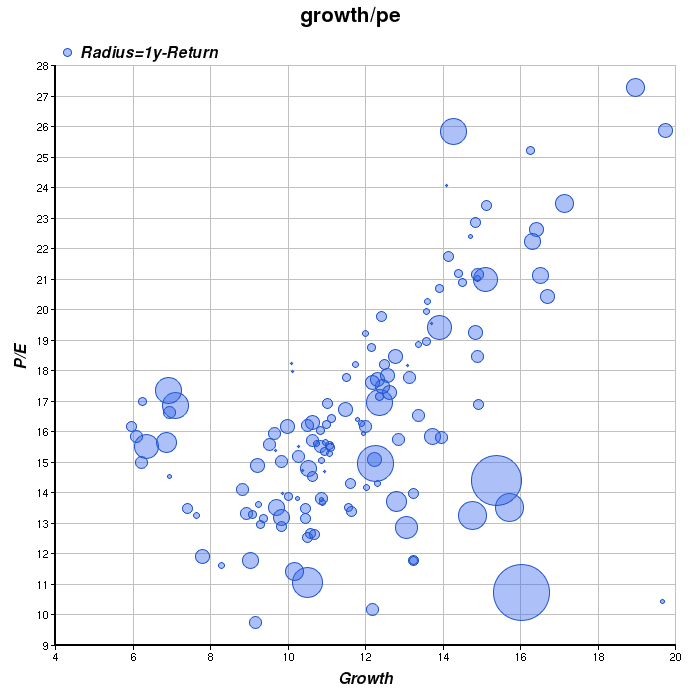 Is the any correlation between P/E and growth? Sure is. When I run a simple linear correlation test between the P/E and the growth vectors of 190 ETFs I normally get a number that is about 0.45. The number fluctuates over time, but it is always positive. In financial data, which is usually very noisy, this is a significant fact. The idea of buying the low right quadrant is a very well known investment strategy. It is often referred to as GARP, Growth at a Reasonable Price. Many successful investors use this strategy. Perhaps the most common reason why strategies fail is that investors without strong enough conviction abandon them when they fail. Every investment strategy has its low periods. Even Warren Buffett has trailed the big indexes during some of the roaring 90's. Abandoning a sound strategy that works most of the time, in the rare period when it fails, almost always makes results even worse. I must mention one caveat about "growth". The growth data is backward looking (trailing 12 months hindsight). And this presentation of the data is implicitly assuming that the (same) growth will continue. At the end of bull markets, growth fails to meet expectations (nothing can keep accelerating growth "forever") and inevitably, growth slows. Moreover, when the whole economy slows down, earnings often start coming down which sometimes leads to negative earnings (losses) and very strong corrections of stock prices follow. Usually after 3-5 years of growth, one should expect a down-year in the markets as a result. The best times to buy stocks are when things look bleakest, around the end of bear markets. What this means is that you should almost always de-emphasize, and discount growth. It is safer to buy long-term sustainable moderate growth, than extreme growth which is bound to disappoint. You should also become a bit more defensive (shift to the left of the chart) after prolonged periods of growth that start showing signs of earning slow-downs and weaker economic reports. What about past performance (bubble radius)? It has been my experience, that during bull markets, the best picks have medium sized bubbles. Why? Picking big bubbles can be very profitable, but is risky because as bubbles inflate they tend to be more and more susceptible to implosion. Late-to-the-party momentum traders buy big bubbles, often regardless of their XY position in the chart. As always, there are exceptions and caveats to the rules. One should do due dilligence on any investment. However, making a bet on a big basket of stocks (ETF) is always safer than making a bet on a single stock within the basket for the simple fact that stocks don't always move together. IOW there's no perfect correlation between different assets within the basket. By diversifying you put the law of big numbers on your side. Why aren't the smallest bubbles a good choice? Value is great, but momentum is important too. You may buy a very small 'dot' and then sit on it for years without seeing it move. This is what traders call "dead money". It tends to happen a lot to deep value investors. In my experience, it is better to hop on a train once it started moving (and lose some relatively small part of the move while riding other trains) rather than wait for months, or years for this particular train to leave the station. One thing that definitely exists in the markets is momentum. Whenever I take a price time-series or a financial asset, shift it a little bit (from a few days to many months) against itself and check the linear correlation of the two price vectors, it shows some positive self correlation. As one example: look at EWT (The Taiwan market) which seems like the best choice by far on the PE/Growth scale. For some reason it almost hasn't moved (appreciated in price) in the past year. Actually, if you look at its chart, it has moved quite a lot, both up and down but its overall (net) move has been relatively small. In other words, EWT is pretty volatile and risky (I look at other charts describing volatility, as well). The question is why would Taiwan lag the rest of the Emerging markets world and by so much? It is possible that the earning-reports there, are less reliable due to weaker stock-exchange governance or accounting rules. It may be that Taiwan is very correlated with the semiconductor index which is very much like a roller-coaster. It may be due to geo-political reasons (e.g. the threat from China) etc. Also note that the data I have tends to exaggerate value because losing companies have a P/E of 'NA' (effectively zero) and so their losses are not accounted for. Whatever the reasons, the lesson is to stay away from outliers and extremes, unless they start showing some momentum by inflating and moving towards "the crowd". When the natural reversion towards the mean starts with such big baskets it tends to last for years. Think Japan in the 80's, US in the 90's. If we were to animate this chart over time during bull markets we would see gradual movement from the lower right towards the upper-left with a gradual curving down. During expansions, company PEs tend (with time) to grow faster than actual earnings until finally they slow down. Also: over multiple economic cycles, each point oscillates around its mean. Different asset classes tend to have different averages. e.g. traditionally, international stocks have had lower P/Es than US domestic stocks because of their relative higher risk. Be aware that these circles are apples and oranges. Not all circles are created equal. Upward surprises tend to cause upward-jumps and earning disappointments steep drops around a generally positive sloped line. As bull markets mature, complacency starts taking hold, and stocks keep going up on momentum with less and less earnings to back-up their prices. Such trends eventually lead to overvalued markets and crashes, also known as the market boom & bust cycle. EWZ (Brazil) has been the best performing ETF in the past year -- as of March 2006 -- with about 80% appreciation. Note that Saudi/UAE and Gulf/oil countries have seen even bigger jumps but there's no single-country ETF representing them. Brazilian stocks still have a very low average P/E and relatively high predicted growth. This is not surprising knowing that Latin American markets have been coming out of many years of slow growth, defaulting on debt, foreign investor flight, and severely depressed stocks. These days Brazil has favorable demographics (a relatively young average population) and (unlike the U.S) a large trade-surplus especially with China. Aside: there's a joke "Brazil is the country of the future, and always will be". There's another (sarcastic) cliche "this time it is different". Here's my view: usually, things aren't different except when they are. One thing that is factually different is that Brazil (like other Latin American countries) used to be a huge debtor country. Surprise: it is no longer one. China's demand for raw materials/commodities has turned Brazil's 'balance sheet' on its head. While China has a huge trade surplus vs the U.S. there's the other end of the spectrum: China runs a large trade deficit vs. Brazil, Thailand, and a few others. Another thing that is interesting (to me) is that Linux is very popular In Brazil. Much more than in the U.S. You may laugh, but I consider this very significant. Not just symbolically and not just due to great savings from not having to pay "the Microsoft Tax" for every IT upgrade. But in flexibility to develop better tailored solutions, in opportunity to reinvest in the local economy via local IS companies, in the improvement stemming from far superior infrastructure security, and more. Having said that, it is important to realize that assets that go up a lot tend to also go down a lot. A high beta (volatility compared to "the market") cuts both ways. Brazil is very volatile. VWO is still comfortably below the PE/Growth=1 diagonal (Note: VWO is missing from the chart because of its shorter than 1-year history). In addition the radius of the EEM (or VWO) bubble is closer to the ideal size ("only" ~43% appreciation vs. ~88% for EWZ). As long as you are aware that these ETFs are risky, keep a really long-term perspective, and buy them on their occassional dips, you should be OK.
Late May 2006, update: Emerging markets had a serious 10-30% correction (India, Turkey and Russia were the hardest hit, followed by Latin America). This was expected after a run up of 50-100%. Still, I believe emerging markets will continue to outperform the US in the coming decade. If you can stomach the volatility expect more sharp corrections, and try to take advantage of them. buying VWO after the May-June 2006 correction has been very profitable. Some more observations: the far top right are "growth ETFs". You would find ETFs covering the technology sectors (Biotech, Software, Networking, etc.) there. Growth stocks are most of the time overvalued, so my advice would be: "stay away" except at the end of bear markets (2-3 years corrections). It is at those times, that the fast-growth stocks get so depressed that buying them can almost guarantee 5 and 10-baggers in 2-3 years with relatively low risk. That's when growth stocks make their biggest runs. My advice, as bear markets end, jump on the smallcap growth oriented survivors/winners, then rotate out. A good example would be buying the few survivor Internet stocks after their 95%-99.9% drops during the 2000-2002 bear markets. At that nadir point, it was obvious that unlike hundreds of other dot-coms, companies like Yahoo, Amazon, Akamai, were long-term survivors. Each of them went up many hundreds of percent in the 4-5 years that followed. Akamai in particular was roughly a 100 bagger for those who bought it under $1. What we learn here is that there's more than one way to skin a cat. Learn many ways and prosper. You can sell your "property" at any time without the very high (~6%) agent commission. You may buy a piece (not the whole) of the property, just spend as much as you want on less/more shares. As always, there's a caveat: if real-estate prices are in the stratosphere, REITs may lose value in a correction. Note that there are different REITs invested in different areas (where real estate may not be overvalued) and types of assets (commercial vs residential, upscale vs low-end, etc.). My advice: do your DD before buying these but they should definitely be part of the diversification plan. Try to avoid "the next microsoft", exciting growth stocks and the latest tech fad. On average you'll be wrong. The potential payout is almost always too small for the assumed risk. Pick a target allocation of domestic stocks (For US stocks use total market rather than S&P500, i.e. VTI and not SPY), To that add some international stock, REITs, and fixed-income vehicles. You may have some percentage of cash (5% - 10%) for flexibility and being able to jump into outstanding opportunities as they arise. Rebalance back to your target asset allocation no more frequently than once a year. There's definitely momentum in the markets (auto-correlation of the time series) so by rebalancing too frequently, you sell winners too soon. Do rebalance. Don't neglect. Things that have wonderful run-ups eventually correct. You want to rebalance to realize the gains and reduce risk going forward. Think of rebalancing as cashing on the past (100% certainty) vs trying to guess the future, which is uncertain. Always include international stocks too, the world is not just the US. In fact currently the US dollar seems overvalued and so more international exposure is important. My favorite emerging market ETF is 'VWO' (Vanguard Word). For developed markets you may use ADRD or EFA. Be aware though that developed markets are highly correlated with U.S. stock markets, investing in them these days is more for hedging against the dollar than for stock diversification. Think about Tax impacts. Do your best to hold assets for at least a year and a day in US taxable accounts (you pay only 15% tax on long-term capital gains). You have more freedom to rebalance if balances get too far more frequently in IRAs and 401(k)s where rebalancing/exchanges are not taxable. In these accounts more frequent rebalancing may be better. The bigger the portfolio is the less costly, in percentage terms, are the rebalancing commissions. When reallocating: don't sell and buy at the same day. Try to sell a bit higher and buy a bit low by using "slow stochastics" (available on any Yahoo! finance chart by clicking 'technical analysis' and then 'slow-stochastics'. Never chase ETFs that go sharply up. They always come down. Again, use slow-stochastics which I found to be one of the best indicators for ~2 weeks term low/high points. Overweight Value stocks over Growth stocks. Over the long term value wins big over growth. See numbers in the sources below. Overweight small stocks over large stocks. Over the long term small beats big. Anything that's very big has slow growth. You cannot grow too fast when you're already huge. Be careful though: there may be long periods like 1990-2000 where large+growth beats small+value. Sticking with small-value requires at least a 20-year period to be highly certain of outperformance. Investing in large-cap value is ok, and recommended. Beware of volatility: assets with high beta are risky, if you buy them, buy them in small portions, and always wait for their dips. Excess activity kills performance. Be passive and don't do too many switches in/out. Women are better investors than men because they trade less. One more time: Diversify! the reason to diversify is not just to protect your downside, it is also to maximize long-term returns. The math is simple, though non-intuitive. To convince yourself, think of a stable 5%/year return, vs a +20%/year followed by -10%/year every other year. While the simple average is the same (5%/year equals [(20%-10%)/2 years]) after 10 years, returns are compounded so what matters is the geomeric mean, rather than the arithmetic mean. After 10 years, the stable 5%/year portfolio will be +62% in the black (1.05 10), while the +20/-10% portfolio, will be at only +47%: (1.2 * 0.9)5. This is why you want to mix assets that have low-correlations together. You want to have a steady as possible annual-return as opposed to one great year followed by a bad one. This is one of the tenets of MPT (modern portfolio theory). There's a good reason why Harry Markowitz won the Nobel Memorial Prize in Economic Sciences for these and other ideas.